I recently found and purchased a perfume from my past thanks to eBay. Years ago while living in NYC, I became good friends with a hip, trendy and beautiful girl who worked in fashion. She always wore the latest designers and scents. 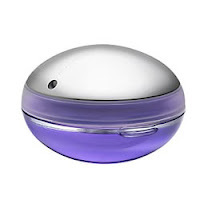 One particular designer fragrance she often wore was Ultraviolet by Paco Rabbane I was smitten by the scent and had to own this perfume. The year was 2001 and I was just getting to know my husband whom I met online. I wore Ultraviolet every time I took the bus to visit him in his New Jersey hometown. Whenever I smell Ultraviolet, it reminds me of when we first met. I love this scent more than any other perfume basically because it takes me back to that exciting time in my life. There's nothing like new romance! It's nearly impossible to find Ultraviolet by Paco Rabbane in stores today, but I will always try to find a way to snag a bottle of this sweet purple potion just to relive those memories of 2001-2002. If I close my eyes, it's as if I'm sitting on that New Jersey Transit bus, my heart fluttering as we inch along Rt. 46 closer to my new guy. I memorized every store, gas station, Jersey diner and strip mall along the bus route that year. Once we passed Target, I would text him so he knew when to meet me at the bus stop by the Wendy's. As a child, I loved Jean Nate. 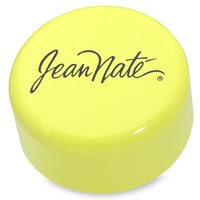 I adored Jean Nate's fancy French name and grown-up aroma. Every year at least one of Mom's students would give her a gift set for the holidays, which she would let me keep. I loved that it came with fancy dusting powder. I felt so mature wearing ladies perfume. Whenever I drowned myself in Jean Nate, I imagined for a moment that I was rich, famous and powerful and lived in a fancy deluxe penthouse in Manhattan - just like Arnold and Willis Jackson and Kimberly Drummond from Diff'rent Strokes. Did I mention Jean Nate is made by Revlon? I moved on from Jean Nate and found a perky, pretty scent, Love's Baby Soft. What preteen girl from the '80s doesn't remember wearing this lovely scent? Packaged and successfully marketed in my favorite teen magazines like Tiger Beat, Love's Baby Soft truly was the perfect perfume for a twelve-year-old girlie-girl. The color of the actual perfume was pink and the name was as innocent as the sweet powdery scent. I don't remember what, if any perfume I wore between ages of 13-14, however, I'm pretty sure 1988 was Red Door by Elizabeth Arden and Poison by Christian Dior. Both are so strong and older-lady-like when I smell them today. That year, my math teacher wore White Linen. I found a bottle in my mother-in-law's room recently and wanted to vomit thinking about obtuse triangles and pentagons. Feel free to read about that here. Christmas of 1989 was the year of Colors by Benetton. If I were to smell that again, it would be as if I jumped into a freaky DeLorean and shot back to high school only Crispin Glover wouldn't be my dad. Colors was a memorable Christmas gift from my parents. Memories of Christmas time with my high school boyfriend, Joe and our teenage love affair would fill my head. I'd probably feel sad, but in a good way. 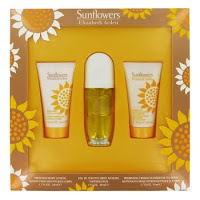 Between 1993-1994 I was all about Elizabeth Arden's Sunflowers. I had the shower gel, lotion, perfume, shampoo - you name it, I had it. I was obsessed with Sunflowers. My friend Tarah would often sleep over after pulling an all-nighter studying for midterms or a late night of partying. She insisted on teasing me. After her shower, she'd would always say, "Oh hey, I used all of your Sunflowers shower gel AND shampoo. Hope that's OK." Of course as soon as I got over Sunflowers, they started carrying it at CVS. I'm trying to remember what scent my mom or grandma wore. I don't think they wore anything really. My mom was always very natural. When I was a little girl, I can remember her often slathering Oil of Olay on her face. She swore that it would keep her skin looking younger and reduce the chance of having premature wrinkles. I wonder if it worked? Though it was most likely her constant use of sunblock, never lighting a cigarette and rarely drinking alcohol that kept her skin looking youthful. I always wished I had taken after her in the complexion department. In my adult life, I still break out and have rough oily/dry skin while her face to this day feels so soft. This brings back so many feelings and memories for me. The abiding scent of my mother is Max Factor's pressed powder. It seemed so grown up! I can't remember her perfume yet, but I'll sure it'll come back to me. Thank you so much for sending me on a lovely journey! White Musk in the disco! Exclamation, Fire and Ice, & CKOne spring to mind. Oh geez ... Sunflowers. I forgot about that one. Jean Nate reminds me of the 70s and my Mom. I'll always love that scent. Now, because of prices and all, I scour the shelves at Marshall's to see what they have to offer. Sometimes they do have some really good scents...sometimes, not so much! *I think I received a Cacharel gift box of several of their scents when I was a kid. Happy by Clinique : I still this this is an excellent fragrance! Although it kinda just got played out. Everyone started wearing it so it didn't feel fun and special anymore. Dudes in pizza parlors would be like, "You're wearing Happy, right? My girlfriend wears that!!!!!" Time to switch! *Vanille Abricot layered with warm vanilla sugar lotion by Bath and Body Works was literally a traffic stopper. People would come up to me in stores and on the street and ask me what I was wearing. I rocked this combo for a long time until one day I literally could not stand to smell it anymore. Just like that, bam, I had to switch to a new scent. *Following in the same sickly sweet notes as Vanille Abricot, and very synthetic smelling if you ask me (but I loved them anyway), I wore Magnetism and Rockin' Rio together and received compliments from strangers. I haven't bought a new fragrance in ages since I've been working in kitchens and perfume isn't allowed to be worn by cooks. Maybe I'll hit Sephora one of these days and try out a new one. I've tried The Beat by Burberry but didn't like the way it smelled for the first 30 minutes. Once the top floral notes wore off and the musky citrus came through was when I liked it most. I'd like to give it another shot. by Paloma Picasso (my Mother in the 80s and 90s). I used to wear Love's Musky Jasmine, not available anymore, and I felt so exotic when I wore that. I made a special trip to a certain department store now out of business to purchase the wonderful fragrance and also my Bonne Bell cosmetics and skin care (also miss my 10-0-6 lotion that they no longer make!) Thank you for sharing your trip down memory lane. Fragrances do bring up some interesting memories! Sweet Honesty from Avon - it was such a nice light scent.